No Veto, but No More Industrial Permits, Either–At Least for a While. a Partial Victory for the Little Missouri River. North Dakota Governor Doug Burgum may not have been in politics very long, but he has learned the number one rule already: Politics is the art of compromise. To that end, the Governor DID NOT veto the section of North Dakota House Bill 1020, which, now that it is law, legalizes the issuance of industrial water permits from the Little Missouri River, a practice which had been going on illegally for many years (If you’re not familiar with that, read this). But in signing the bill into law yesterday, he issued what Donald Trump might wave in the air as an “executive order,” declaring that no new permits will be issued for non-agricultural use of water (fracking) until new rules are written governing those permits. Those new rules are likely to address use by counties to draw water to keep the dust down on gravel roads, but hopefully will ban water for fracking. That’s probably okay. We’ll see what they say. Generally, this is an acceptable compromise, I think, with those of us concerned about the industrialization of the Little Missouri River—with one exception—and it might turn out to be a pretty big one. 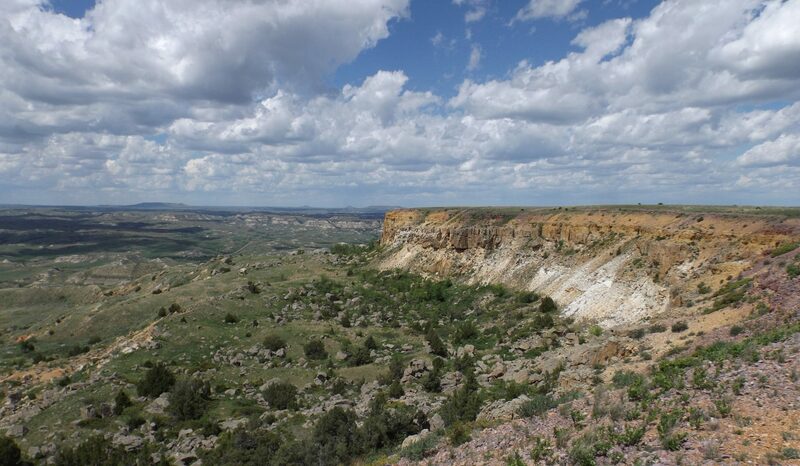 The Governor’s order applies to the Little Missouri between the South Dakota border and the Long X Bridge over the river at Highway 85, on the east end of the North Unit of Theodore Roosevelt National Park south of Watford City. That’s about 85 per cent of the river’s 275 mile length in North Dakota. But it doesn’t apply to the section of the river between the Long X Bridge and where it flows into Lake Sakakawea, a distance of about 40 miles, mostly in Dunn County, and that last 15 per cent is in an area which has been the hotspot of oil activity in the Little Missouri Bad Lands. My friends who keep an eye on oil activity in threatened areas tell me there are a number of large applications in process or pending just east of the Long X Bridge, and there’s a lot of Forest Service and BLM land that could be affected if industrial activity is allowed, including some incredible landscapes and wildlife habitat, as well as multi-generational ranches. So we will need to keep a close eye on this process. Which the Governor is going to make easier for us, because he has ordered the Water Commission staff to make “the process and requirements for future issuance of temporary use permits for non-agricultural uses” transparent. Believe me, we’ll be taking advantage of that order. Looking at every permit. Further, he ordered the Water Commission staff to make public all available data on the temporary use permits issued since 1990 and to do a preliminary report on that within 60 days. July 1. Maybe we’ll read in that about the rancher along the river who sold the water from his temporary use permit to an oil company for more than $700,000 back in 2012 and 2013. Well, okay. It just seems a little strange that the people who are responsible for issuing all the water permits in the state of North Dakota wouldn’t know the law, but that’s their story. I hope they are telling the truth, and not covering up for some superior (prior to Burgum, maybe named John or Jack) who told them to go ahead and issue the permits in violation of the law—oil booms and all the money that accompanies them can cause people to do strange things. But at the same time, if they are telling the truth, it’s kind of disappointing that they wouldn’t know the law they are charged with upholding and enforcing. The engineers responsible aren’t some rookies right out of college—they’ve been career employees and have risen to the positions of director and assistant director of a division of one of the most important agencies in state government. How could they not know the law? Well, anyway . . . The best news of all from the Governor this morning is that he has decided to revive the Little Missouri Scenic River Commission, the board created by the State Scenic River Act in 1975 to monitor development along the river. Some of us have been urging the Governor to do that since we discovered a couple years ago that it hasn’t met since 2007. You can read more about that here. If that board had been active the last ten years, none of those illegal industrial permits would have been issued. I consider the Governor’s order a major victory for the Little Missouri State Scenic River. I’m going to the first meeting. Where hopefully they’ll be talking about the two proposed new bridges across the Little Missouri River. But that’s a story for another day. So. The hundreds of people who contacted the Governor and asked him to veto the law got half a loaf—maybe more. Now we will all know what has been going on, and we will have a chance for input and reaction to what goes on in the future (I just caught myself before I said “going forward” there, a phrase I hate). Constant vigilance will be necessary now. I think we’re up to it. Gov. Doug Burgum expressed concern for the Little Missouri River. Rightfully so. He owns ranchland on the river. Here’s the letter I got from the Governor this morning, as did the others who contacted him about this. Thank you for your input on House Bill 1020. I appreciate your concerns and would like to take this opportunity to explain why I have signed the bill into law. As governor, a North Dakota resident and a property owner on the Little Missouri River, protecting our environment and being responsible stewards of our natural resources is a priority for me personally and for our administration. The Legislature enacted a chapter of law called the Little Missouri State Scenic River Act (LMSSRA) in 1975 to preserve the Little Missouri River as nearly as possible in a free-flowing natural condition, and to establish the Little Missouri River (LMR) commission. Records pertaining to LMSSRA indicate that it was enacted primarily because of concerns over several energy projects having interest in dams and diversions for purposes of coal gasification or electricity generation. The legislation allowed for agricultural water permits but not for industrial uses. However, more than 600 temporary use permits have been issued for non-agricultural uses since 1990. Recently, a State Water Commission (SWC) hydrologist uncovered the 1975 law. A decades-long lapse in awareness and in practice has brought us to today. Currently, there are 35 temporary use water permits issued in the Little Missouri River basin. Of these, only two have been issued in the area from the North Unit of Theodore Roosevelt National Park (TRNP) to the South Dakota border, and neither of these is on the Little Missouri River proper (http://www.swc.nd.gov/pdfs/littlemo_temp_permits.pdf). Been assured by the State Engineer that no conditionalwater permits have ever been, or will be issued establishing industrial water rights from surface water in the Little Missouri River basin. Asked the State Engineer to immediately suspend the issuance of any new temporary non-agricultural use permits in the Little Missouri River basin upstream from the Highway 85 bridge(known as the Long X Bridge), at the east end of the North Unit of TRNP. This area of new permit suspension stretches from the North Unit of TRNP, south along the river, through Medora, past Marmarth, N.D., all the way to the South Dakota border, and includes the entirety of the Maah Daah Hey Trail and both units of TRNP. Initiated the reinstatement of the Little Missouri River Commission. We have searched archives and the last recorded meeting of this commission was held in Dickinson in 2007. Commission membership, by law, includes the Director of the North Dakota Parks and Recreation Department, the State Health Officer, and the Chief Engineer of the State Water Commission, or their designated representatives; and one member from each of the following counties, appointed by their respective county commission: McKenzie, Billings, Slope, Golden Valley, Dunn and Bowman. The county representatives must be resident landowners who live adjacent to the Little Missouri River, with the exception of the Golden Valley County representative. The governor’s office will work with the State Water Commission and the respective county commissions to re-establish an active Little Missouri River Commission. Asked the State Engineer to immediately review, modify and make transparent the process and requirements for any future issuance of temporary use permits for non-agricultural uses, and to make public all the available data on the temporary permits that have been issued since 1990. The State Engineer will deliver a preliminary report within 60 days. Also, this report and its findings will be presented to the Little Missouri River Commission and the State Water Commission. No new temporary use permits will be issued upstream of the Long X Bridge until the new system for application and approval is created. Asked the State Engineer to evaluate the future need for additional Little Missouri River stream gauges. Presently, the SWC continuously monitors stream gauge flows in the Little Missouri River at three locations: Marmarth, Medora and the Highway 85 bridge. Many letters expressed concerns about water depletion in the LMR due to the industrial permits. The initial review of the river flows indicates this is a false hypothesis. In a typical year, there is over 300,000 acre-feet of LMR water flowing past the Long X bridge. The peak year was the big flood year of 2011, when it reached a modern record of 1.1 million acre-feet of flowage. The low year of flowage since electronic recordkeeping began at the SWC in 1990 was 49,000 acre-feet (1992). In 2012, the peak year for industrial use between the TRNP North Unit and the South Dakota border, total reported use was 47 acre-feet, and it accounted for less than one-tenth of 1 percent (0.1%) of the total stream gauge flow. For comparison, agricultural use that year was 1,024 acre-feet, while the Bully Pulpit golf course at Medora typically draws 155 acre-feet from its conditional use permit. Most temporary use permits are issued for periods of three to six months with a maximum of 12 months. All temporary permits are subject to cancellation by the State Engineer at any time, including for any violations in use, or when necessitated by drought conditions. Temporary use permits cannot be renewed. A new application is required upon the term ending for the temporary use. Many of temporary use permits (265 of 600) issued between 1990 and today were to support construction projects, including using water for dust control or as part of road/highway construction. Limiting the impact on depletable water sources such as aquifers and artesian springs, a real concern in the area of the Fox Hills aquifer. Avoiding the need to haul water across long distances, thereby reducing truck traffic and dust that impact wildlife, livestock, vegetation and human health. Eliminating temporary use permits would directly and substantially increase truck traffic within the LMR basin. Reducing the risk of human injury from truck-vehicle collisions that may result from increased traffic congestion, as well as reducing the risk to wildlife. Truck vehicle miles traveled in North Dakota increased 88 percent from 2007 to 2015, and traffic crash fatalities increased from 104 in 2008 to 170 in 2012. Reducing costs associated with building and maintaining roads due to increased heavy truck traffic. If you desire additional technical information, or information on river flow, please contact Garland Erbele, State Engineer for the Office of the State Engineer at (701) 328-4940 or swc@nd.gov. Our rivers, streams, lakes, aquifers and artesian springs provide a resource that supports our diverse economy, including the tourism/recreation, agriculture and energy sectors. Thank you for your passion, concern and engagement in the public discourse about our conservation heritage and legacy. Jim, thank you, for being ‘eyes & ears’ for people like me who are pulled in too many directions to maintain perpetual vigilance over public agencies, agencies which seemly forget their mandate to those of us who hope to continue living in the North Dakota land, water, & sky we love. I am glad to hear that Governor Burgum received 100’s of letters. It was your blog which prompted me to write. Y’know, Alice, this was a victory for social media. There has not been a single story about this in the secular media. All done on blogs and social media. I was just up to the South Unit of the Park over the weekend, (from MPLS). The river and the route it has carves over the millenia, is astoundingly beautiful. It would seem to be a crying shame to sacrifice it for short term financial gain of a very few. Gov. Burgum’s response to all of us who contacted him was well thought out and seems reasonable. I am especially interested in what sounds like his decision to encourage transparency in government. Yes, we will need to keep an eye on this.Thank you, Jim, for being a watchdog on the environment and for helping us all support preservation of our land, water and natural resources. Meanwhile in Wisconsin where I live, a plan to continue allowing high-capacity water wells for agriculture in the central sands region was reapproved in the Legislature. A front-page story in my local newspaper on Sunday told the story of a man who built his house on a lake, and 10 years later the shoreline has receded 20 feet. Some famous said, “Eternal vigilance is the price of liberty.” I agree. We’ll keep watching. Well finally something GREAT happened through our E-mails!!!! TY Jim for the notice to send these e-mails My hats off to you!! You should be very proud today!!!! And also to all the people that sent them too TY I know the Gov did the right thing so TY gov!! See this article from the Washington Post, yesterday. Same company behind Dakota access pipeline causes big spill of drilling mud etc. into pristine areas in Ohio. Be ware!